The CDA CCP3SS is a one and three quarter bowl corner sink in stainless steel. It is corrosion and rust resistant to withstand tough use in the kitchen and its finish and design are both elegant and sleek, complementing your modern kitchen perfectly. The CDA KA22SS is a one and a half bowl sink in stainless steel. It is corrosion and rust resistant to withstand tough use in the kitchen and its finish and design are both elegant and sleek, complementing your modern kitchen perfectly. The CDA KA32SS is a one and a half bowl contemporary sink in stainless steel. It is corrosion and rust resistant to withstand tough use in the kitchen and its finish and design are both elegant and sleek, complementing your modern kitchen perfectly. The CDA KA55SS is a single bowl sink with mini drainer in stainless steel. It is corrosion and rust resistant to withstand tough use in the kitchen and its finish and design are both elegant and sleek, complementing your modern kitchen perfectly. The CDA KA80SS is a single bowl sink with an extra smooth, stainless steel finish, making it very easy to clean. It is corrosion and rust resistant to withstand tough use in the kitchen and its finish and design are both elegant and sleek, complementing your modern kitchen perfectly. The KR21SS is a stainless steel single round sink. It is corrosion and rust resistant to withstand tough use in the kitchen and its finish and design are both elegant and sleek, complementing your modern kitchen perfectly. The KVF21LSS is a heavy grade stainless steel, flush-fit sink. This sink has an extra large single bowl and a left hand drainer. The minimally styled sink is designed to fit flush with your worktops creating a stylish and contemporary look. The KVF22LSS is a heavy grade stainless steel, flush-fit sink. This sink is a one and a half bowl with a left hand drainer. The minimally styled sink is designed to fit flush with your worktops creating a stylish and contemporary look. 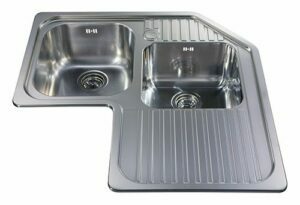 The KVF22RSS is a heavy grade stainless steel, flush-fit sink. This sink is a one and a half bowl with a right hand drainer. 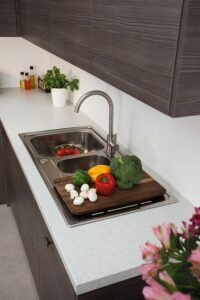 The minimally styled sink is designed to fit flush with your worktops creating a stylish and contemporary look. The ultimate in practical style, our comprehensive range of stainless steel sinks come in various sizes with one, two or one and half bowl options. We use the highest grade steel to make sure that they stand up to the test of time and have included refreshed drainer designs that will update even the most practical of kitchens. There are a huge range of sink styles in this range to choose from. That’s why we have prepared the ‘what size’ sink guide for you to help you decide which size is going to be right for you. Stainless steel is such a flexible style that it suits every type and style of kitchen. It is practical, easy to maintain and looks fantastic with almost any design of tap and work surface. So much so that we have made a complete range with options in tiny sizes to huge down bowl designs reminiscent of a professional chef’s kitchen. All that is left for you to do is pick your favourite. Starting with the most unique, the corner sink is designed for unusual layouts, sizes and shapes of kitchen where you still need 2 full sink bowls but not necessarily next to one another. This incorporates two drainers to give you extra work room and make the most of the design’s size. 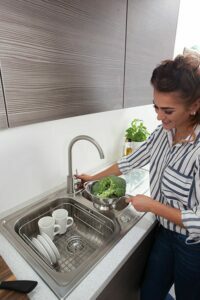 If you just need the tiniest of sink and drainer spaces then take a look at the KR20 & KR21 mini sink and drainer for something unique and space saving. This would be perfect for a tiny city kitchen, a utility room or a bar area in the home; the uses are endless. In the one bowl design there are multiple options to choose from. We have the economical and budget friendly KA range with options in compact designs, one to one and a half bowls, different sized drainers and deeper and shallower bowl styles to suit exactly what you need. At the top of the stainless steel range, the KVF collection combines the practical and professional elements of stainless steel with modern aesthetics to create large bowl work stations that feature smooth, stylish drainers. Stainless steel is naturally hardwearing, practical to clean and hygienic. We use only the highest grade of steel in our range and include noise deadening pads with the fixing kits to reduce any noise associated with metal being bashed or banged. Steel is a great option for creating a durable and even professional looking kitchen space. Combine with a coil tap to create the chef’s kitchen style or stay simple and practical with a single lever tap for a more budget-friendly option. Whichever model you go for, take a look at our sink cleanliness guide to keep your kitchen fresh and your sink area looking new for as long as possible. 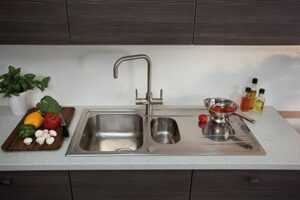 If overmount sinks are not for you and you are looking for something more streamlined, we also do a complete range of stainless steel sinks in a range of sizes, in an undermount installation option. Click here to find out more about what an undermount sink is or click here to look at the range.